Are you struggling to tuck your little one in for bed every night? You are not alone! Most parents agree that one of the most challenging things about raising a toddler is dealing with their tantrums, especially bedtime tantrums. Why do our toddlers throw tantrums anyway? How are we supposed to deal with this behavior? Tantrums are perfectly normal for kids between the ages 1 and 3. It is a normal part of their development. At their age, their language skills are just starting to develop. They are beginning to explore the world and try to gain control over their environment. Because there are times when they discover that they can’t always do what they want, they will throw a tantrum. Wondering how to deal with toddler tantrums at bedtime? Read this article for some helpful tips. One of the things young kids hate the most is being surprised into ending their day, especially when they are still having fun. They want to be in control and telling them to go to bed in the middle of their enjoyment isn’t such a good idea. What you can do instead is to set their expectations and describe how the rest of the day will look like. For example, you can tell them that after dinner, they can watch television for a bit or play with their toys. Then they have to brush their teeth, take a quick shower, put on their pajamas and be ready for bed. Be sure to follow through the plan instead of just talking about it. Once you have established a routine and followed through it consistently, putting them to bed will no longer be a struggle. Giving your toddler choices does not mean allowing them to decide when to take a nap and when to go to bed. Offering choices means letting them make a choice about some parts of bedtime. For example, you can ask them which pajamas to wear, or which bedtime stories to read. Doing this will help their growing sense of independence because it makes them feel they are actually in control of something. Another reason why kids throw bedtime tantrums is separation anxiety. What some parents don’t know is that the hours their children are apart from them actually feel long. Ease separation anxiety by spending more time on snuggling before sending them to bed. Read them a book, play a little and just spend a few minutes to make them feel comfortable and secure. A toddler throwing tantrums is enough to make any parent’s head explode. But do not give in by showing how distressed you are when they melt down. Instead, try to remain as calm as possible. Easier said than done, but it’s an effective way to make your little one know that they won’t get a rise out of you. This will also make them calm down faster. Make sure to remain firm and calm. Don’t give in to your child’s demands simply because they are throwing a tantrum. Also, don’t push back or bend the rules once you’ve said them. If bedtime is set to 8:00, do not cave in and stick to the schedule. 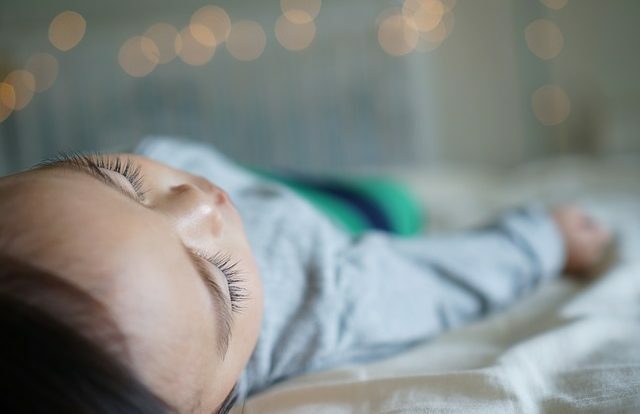 Sleeping in an empty bed can feel lonely for your child. This is one of the possible reasons why they could be throwing tantrums before bedtime. What you can try to do is to give them a comfort toy that could convince them to go to bed. It can be a new stuffed animal or a pillow or blanket with the print of their favorite cartoon character. Having something to tuck into bed with should do the trick of disrupting toddler tantrums. If you have been trying to find ways to deal with toddler tantrums, worry no more! These helpful tips are the answers to your dilemma. Remember, toddler tantrums are just a normal part of a child’s development and knowing how to handle them better will benefit both you and your little one. And if you are looking for other ways to help foster your child’s sense of independence and future success, provide them with a good quality early childhood education. Enroll them in Imagine Nation Learning Center. Please feel free to give us a call for more information.